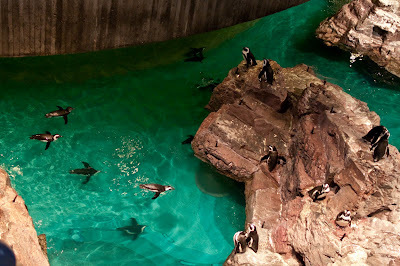 When looking into the penguin exhibit you may wonder about those black circles on the islands. They are actually lawn sprinklers that were added to the islands when they were being built. 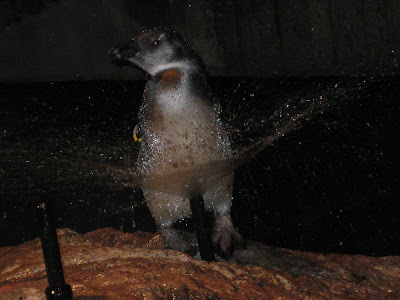 Since we don't have waves, wind or rain in the exhibit to rinse off the islands, the sprinklers spray salt water three times a day to simulate these natural environmental actions. The extra spraying also helps rinse the guano - penguin poop - off the islands in between our daily cleanings. ... some jump right in the water, and some seem to actually enjoy the water sprinkling down on them! We'll be posting a cute video of the sprinklers in an upcoming blog. You won't want to miss this one so check back again soon!